He loved baseball. And he loved the Houston Astros. George Herbert Walker Bush had a burning love for the Houston Astros baseball team, and for baseball in general. Going back to his days in high school, he was captain of his school team. At Yale, he lead that team to two college world series as a first baseman. During that time, he met Babe Ruth. They posed for a photo together just weeks before Ruth died of cancer. Former Astros owner Drayton McLane got to spend a lot of time with the Bush's. 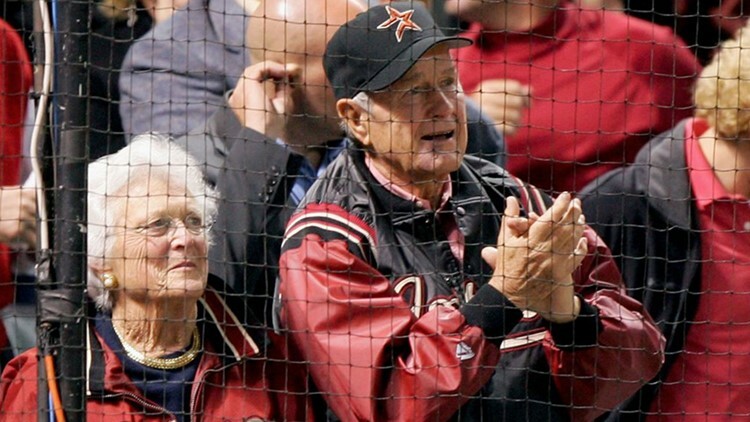 The former president and first lady always had two seats waiting for them right behind home plate. “They love the players, they love the fans. I have never, ever, seen a fan come down and ask the President or Mrs. Bush for an autograph that they wouldn’t do it,” said McLane. Through the years, the players said it was nice knowing the former president was there to support them. “It’s a pretty neat thing when you can have the President of the United States come out and, you know, as a fan of the game. So, there’s big appreciation inside that club house,” said former Astros player Craig Biggio. The fans and players will miss the man they often called '41'. The former president who made visits to Astros games all the more special, knowing he was there.